Lake Anna Striper Guide Journal: What goes around comes around! Ricky has been fishing the lake since it was inundated and anyone who has ever fished at the third dike will recognize this man [although a lot grayer]. 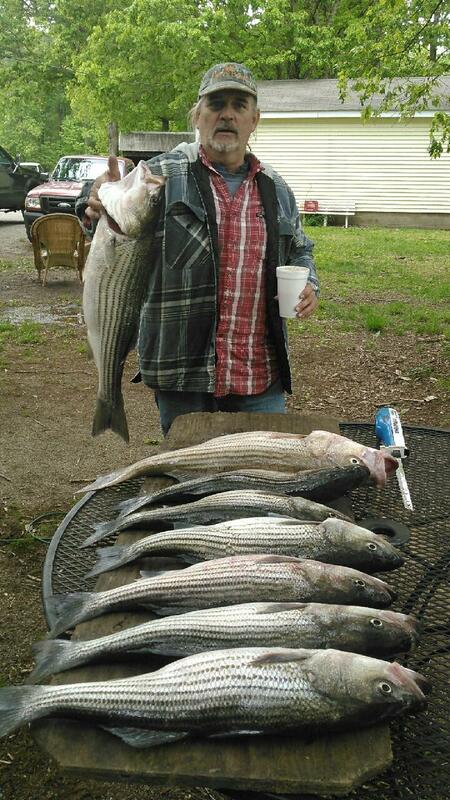 He has helped everyone who has fished the dike and brought his children up catching Stripers there. I can't remember how many times I saw him either there or out in his boat with his son Timmy [works at High Point]. Well Timmy has taken the reigns form his master and is now one of the top Striper fishermen on the lake and dragged his Daddy out on the lake this morning for some payback. They went out for a couple hours and "Spanked" the Stripers this morning. Ricky is pictured with only 8 fish because that is the limit for two anglers but I saw them hooked up continuously for two hours this morning.I am sure Ricky is not very impressed with the catch, he is from the generation when fishing at the dike they threw back 15 pounders all day. Looks like Ricky is waiting for Timmy to quit taking pictures and clean his fish for him. Great to see these two fisherman on the water together.